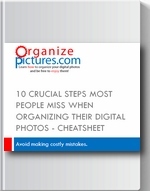 Learn the simplest and most efficient system for organizing your digital photos! Most people want to just shoot pictures and ignore these crucial steps for organizing their collection of digital photos on their computers. Then they wonder why they are frustrated when looking for photos and trying to do fun projects with them! Subscribe to my newsletter and get 10 Crucial steps NOT to miss, along with videos and media organization tips & tricks delivered directly to your inbox. Just enter your name and email below. It’s all free! I’m a dad and soon after my first child was born I became completely overwhelmed by how many digital photos I was taking. I couldn’t find any of the photos, and every day when I would transfer more photos to my computer…well I just piled them somewhere without any sort of organization. I was lost! 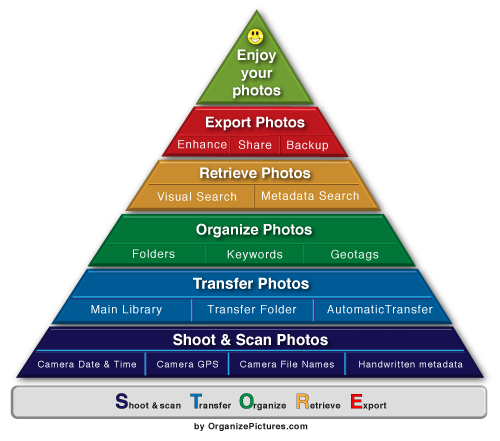 Over the last 10 years, after reading and trying everything, I have developed the simplest and most efficient system for organizing my digital photos. I call my system STORE because it covers everything about digital photos and videos: Shoot & Scan, Transfer, Organize, Retrieve and Export. And over the last 10 years I have helped hundreds of people to take control of their growing media collection so they can organize, use and share all their precious digital memories. My courses contain everything I have learned and taught for more than 10 years. You get all my books plus 6 video modules containing over 30 detailed videos that will show you how to organize your digital photos step by step. Developed and refined over 10 years of reading, talking and helping people, my books capture the system I use to manage over 100,000 photos and videos. Get started now with free tutorials!